There are all kinds of things you can do to help keep your skin glowing and healthy. Following a regular skin care regimen is key in making this happen. Healthy habits, like regular exercise and limiting your exposure to sunlight can also make a difference, but one of the biggest secrets to glowing skin is in your kitchen. Plenty of healthy, fresh foods can play a big role in keeping your complexion happy and glowing. The right foods can help reduce inflammation, strengthen your immune system, and serve as an excellent source of antioxidants—and all of these factors are fantastic for your skin. Superfoods can help you stay healthy on the inside and on the outside. Below, a few favorite foods to stock up on for glowing skin. Tomatoes, especially cooked tomatoes, are rich in lycopene, which can be your complexion’s best friend. This ingredient can help protect your skin from UV damage and may boost collagen. (Scientists also believe that lycopene may reduce the risk of heart disease!) Tomatoes can also help reduce and clear up acne. Mariah Carey once revealed in an interview that she eats salmon every day, and her beautiful skin is a perfect example of why we could benefit from a little more of the nutrient-rich fish in our diets. Salmon’s high concentration of omega 3s can help your skin heal from damage and protect it from some of the risks of sun exposure. Salmon can also help keep your skin soft and hydrated while preventing signs of aging. There’s nothing quite like digging into a poached egg at brunch, but eggs do more than just make your taste buds happy. Eggs are loaded with antioxidants that help prevent sun damage like brown spots and may even reduce your risk of skin cancer. They’re also a good source of biotin, which can help your hair and nails grow while clearing up acne and dryness in the skin. The fatty acids in avocados can keep your skin hydrated and keep it more vibrant when exposed to UV rays. The omega 9s in avocados will leave your complexion soft, hydrated, and dewy. The tasty toast-topper can also help your skin fight off free radicals, which can help prevent aging. Most of us remember our parents telling us to eat carrots as kids so we’d have healthy eyes. Carrots can definitely help keep our peepers in top shape, but they can also work wonders when it comes to skin care. Vitamin A and beta-carotene found in carrots can help clear up acne and may also help reduce the risk of skin cancer. It’s no surprise that this well-loved green is good for you. Spinach is thought to reduce the risk of skin tumors and other cancer cell growth. These tasty fruits are an excellent source of vitamin C. There’s a reason this antioxidant is so popular: in addition to its many health benefits, like potentially reducing your risk of cancer, it can also increase collagen production to keep your skin looking youthful. The vitamin C in strawberries can also reduce lines and wrinkles in your face. In addition to the dentist, eating an apple a day just might keep the wrinkles away too. Antioxidants found in the peels of many apples may help protect you from skin cancer, while also potentially warding off the appearance of aging. Apples, particularly the antioxidants in the peels, may also reduce your risk of heart disease, which is a pretty fantastic benefit in itself. 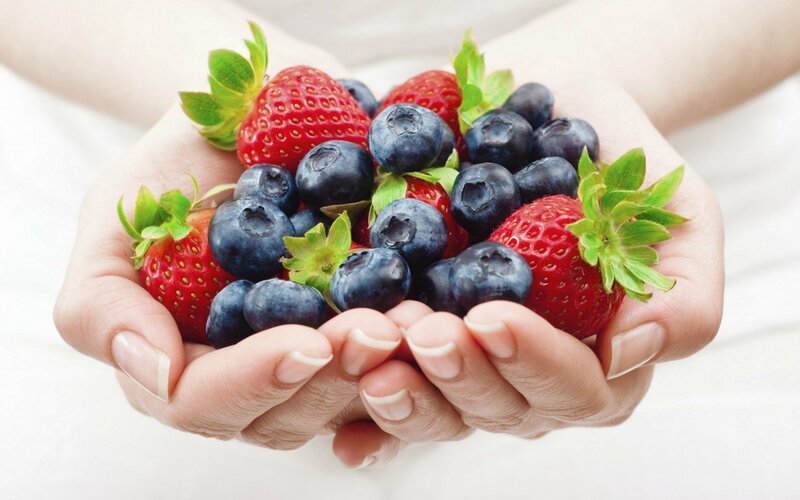 These delicious berries are known for their high concentration of antioxidants, and that’s great for both your overall nutrition and for the care of your skin. Blueberries can help your skin fight off free radicals, boost collagen production, aid in clearing up acne, and reduce inflammation. If you start your day with a glass of lemon water, your skin is already thanking you. Lemons are full of vitamin C, which is great for creating collagen and elastin as well as fighting off free radicals. Lemons also can help neutralize the body’s pH levels, which can help to heal dry skin. The high amounts of collagen, amino acids, magnesium, and calcium in bone broth are an excellent combination for your skin. Bone broth can help keep your skin smooth and youthful looking while aiding in reducing inflammation. When it comes to skin care, this superfood lives up to the hype. Kale is packed with vitamin K, vitamin E, vitamin C, and sulfur compounds. Regularly eating kale can help to maintain clear, glowing skin. Green tea’s antioxidants can help reduce inflammation, and may also help prevent skin cancer. Research has found that green tea may also help prevent acne and reduce the impact of UV ray damage. Just remember: green tea has caffeine, so you may want to go easy on it at first!